I live in Atlanta. The term “snowpocalypse” was probably born here. I’ve also lived in St. Louis and Minnesota plus travel to plenty of places which get rough weather in the winter and are better equipped to handle it. When snow or ice is on the way in Atlanta, we generally buy every loaf of bread, gallon of milk, and twelve pack of beer in the grocery. Then we just shut the city down and stay home for a few days. This January, we messed that up and told everyone in a city notorious for bad traffic to hit the roads at the exact time a winter storm hit. I hung out in San Francisco where I was for business while my family got stuck in traffic for 9 hours and 10 minutes. The politicians proclaimed that would never happen again. A couple weeks later, the city faced another winter storm and made sure we wouldn’t have another incident like before. Schools were cancelled ahead of time and businesses prepared. We had enough beer and bread to last at least two weeks and ate really well over the next three days. As a kid, I relished times like these. We’d stare out the windows at the gray sky and do our best to spot a single snowflake. That chance was enough to get us out of school. Of course, these situations play havoc with school schedules for the rest of the year and as adults, it can impact quite a bit. As kids, we loved it to death. 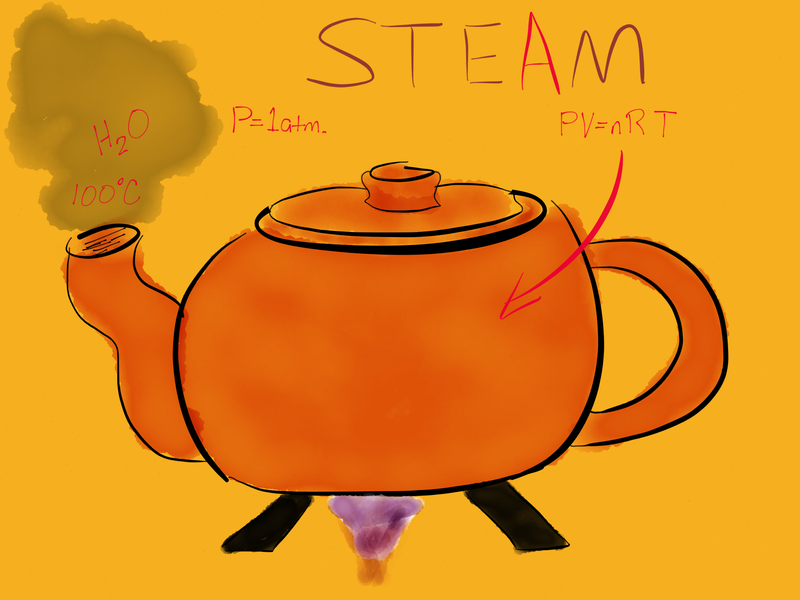 STEAM – Combine it all with no stigma and see what happens. This time, something different happened though. My youngest son goes to a private school focused on STEAM – Science, Technology, Engineering, Arts, and Math. The kids are bright and there’s an atmosphere where geeks are the norm. My wife and I have 5 engineering degrees between us so we love this for him. My wife also used to teach high school math and regularly tutors. The school’s principal proactively had work assigned by the teachers and the kids had to do 6 hours of study a day while Snowpocalypse Part Deux had us shut down. It didn’t need to be focused 100% on textbooks but was meant to encourage the students and the parents who were involved to make sure it happened. A strange thing – in our minds- happened next. We posted the email from the principal to Facebook and my wife got a few negative remarks on hers. The comments had to do with just letting the children be and enjoy the time out of school. We were overjoyed that an administrator who was in charge of educating children made sure learning would happen. I don’t recall seeing any negativism by my friends or parents of my son’s schoolmates. There were a few posts back and forth and it hit us that something was going on trend-wise. We happen to live in Georgia which perennially has school systems ranked near the bottom of the country. The joke is that we could just transfer the educational funding to road maintenance, reduce traffic, and only fall a state or two in the rankings. At the same time, we’ve also gotten into a pattern as a society that places blame on teachers for outcomes. Don’t believe it? My wife had regular issues as a teacher where parents would ask for special treatment for their kids regardless of the scenario including cheating. The relationships always seemed to be about what she was doing to their kids. As a tutor, it’s what she can do for their children. At my son’s last sleepover birthday party, they boys ate pizza and talked smack – over geography. When we went to a pot-luck dinner, the students got up on stage and performed in order to get dress down days. They played piano, guitar, and sang Katy Perry songs. All of them laughed and enjoyed it while none of them made snide comments. My son plays Minecraft and builds entire networks of self-powered machinery to mine the virtual world and create. He’s coding and loving it. It’s never too early to build confidence and an environment of collaboration. There are so many articles written about the state of education in this country and much of it is negative. The issue isn’t solely with curriculum and teacher support. It’s doing away with taboos and the fear of failure or being yourself. The parents with children attending the school all want their sons and daughters to do well and get involved. The teachers are free from the second guessing which can happen in other environments. As an additional bonus, the school’s a very mixed cultural environment. When I look at what my son’s going to need to compete in the job market, this is the kind of environment I want him growing up in. He’s not going to school for grades. He’s going to school to learn and understand how to reach his potential in a positive way. This is where the leaders of tomorrow will come from and the time to start is when they’re young. Interesting reading, as always, Eric, and reminds me of something that happened last week. I was walking into my last day of graduate school last Saturday, and the University happened to be hosting a state competition called Destination Imagination, where a group of middle schoolers (i.e., geeks) participate in a creative problem-solving competition. I was a proud participant back in the day (it’s earlier name was Odyssey of the Mind). Of course seeing the students brought back great memories. More importantly, I was reminded that of all my education, Odyssey of the Mind is what I credit most with helping me be successful at work. I’m not alone — my friends from those days have gone out to do big things, and all of us credit those middle-school experiences with our success. Think I’ll go write a thank-you note to our teacher, Mrs. J. And way to go for fostering those experiences for your family. Great story and congrats on the accomplishment!